A beach home in San Diego is a big dream, but one in Encinitas is very specific. Those who know Encinitas love its very walkable and beach-close downtown area, Farmer’s Market, great surfing sports– and beach homes that range from funky to palatial. There are several beaches in Encinitas including Moonlight Beach, Swami’s, Beacon’s Beach, Stone Steps Beach, Leucadia State Beach and Cardiff State Beach. Almost all are known to local and international surfers. 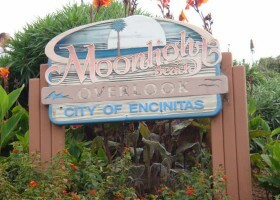 Encinitas beaches are bounded on the north by Carlsbad and Carlsbad State Beach and bluffy Solana Beach to the south. Magnificent, custom built, gated Spanish estate on .69 acres in fabulous beach town of Leucadia. Likely to have been designed by Lilian J. Rice. Partial ocean views on a peaceful & serene lot. Beautifully maintained Spanish architecture with 6 bedrooms, loft & library. Boasting wood beam ceilings, bronze rosette door handles and wrought iron sconces and fixtures. One of a kind opportunity with no HOA or mello-roos. Space to customize with a pool, guest house and accessory unit. Experience the ultimate Encinitas lifestyle from this inviting beach home located right up the hill from Hwy 101's downtown area & steps from the library & View Point Park! Enjoy sunset/ocean views from the rooftop deck or an evening with friends in the tranquil backyard that features an outdoor living space with fireplace amidst surrounding gardens! This coastal charmer boasts 3BR/2.5BA, including an upstairs Master Retreat, 2BRs downstairs (1BR is used as an office), plus a converted garage/yoga studio!